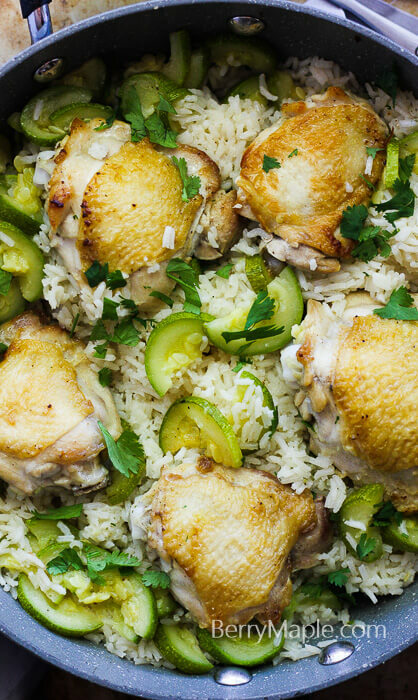 Juicy zucchinis and white rice, delicious chicken thighs… what a perfect combination! Sprinkle with some cilantro and the dinner is ready! An easy one pot dinner that will not disappoint you! I got fresh zucchinis and cilantro from our local farmers market in Modesto. Love that place! Every Saturday i drive kids there and we always have a great time and leave with a lot of full bags! Who doesn’t love one pot dinners? Easy, no mess and almost no dishes to clean. What a deal! 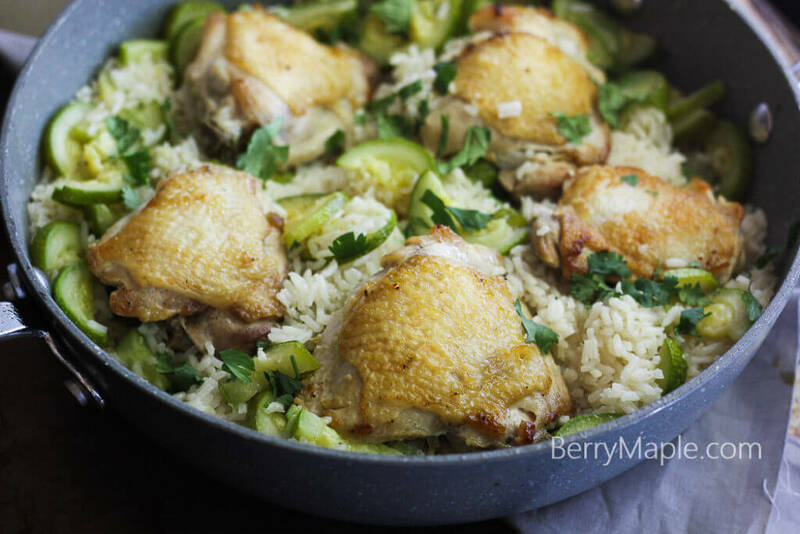 I cooked this one pot chicken thighs and zucchini rice for a dinner for a family of 4(me, my husband and 2 toddlers), and we had plenty leftovers for the lunch next day! It will also work great as a meal prep or a lunch to school or preschool( just cut the meat of the bone first). 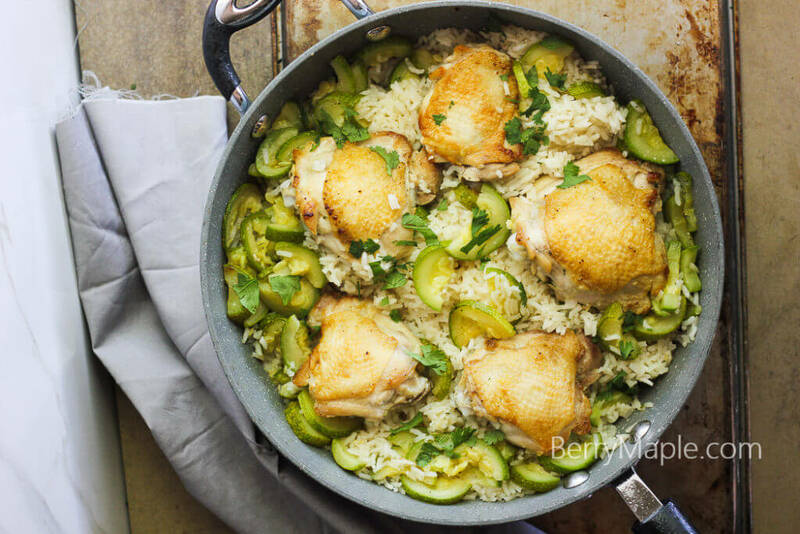 Juicy zucchinis and white rice, delicious chicken thighs... what a perfect combination! Sprinkle with some cilantro and the dinner is ready! In the same, now empty skillet, sear sliced zucchinis( don't slice them too thin or they will be mushy) and chopped garlic, for couple minutes. When the rice is done, remove chicken from the skillet and stir the rice. (SEE NOTES) Place thighs back to the pan and sprinkle with chopped cilantro. Optional. 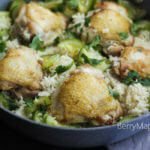 You can place the chicken under the broiler in your oven for a few minutes while mixing the rice. This will make the skin crispy again.